We invite SANG Stitchers to change the world…one child at a time. I am incredibly excited to announce our major community outreach project for this year: once again we will be stitching in support of Love Quilts USA. Love Quilts USA is taking on the mission started by Love Quilts (the organization we supported the last time we stitched quilt squares as our outreach project) … making quilts for sick children using cross-stitched squares donated by stitchers around the world. 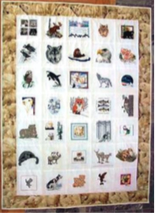 If you go to their website (http://www.lovequiltsusa.com/), you can sign up to donate for a specific child (each child gets to pick their theme) and will have a deadline to send the square to Love Quilts. They also need “Any Child” squares that they can use to fill out a quilt that didn’t get enough donated squares, or to make emergency quilts for children who (for whatever reason) may not be able to wait for a specific themed quilt. Stitches: Please do not stitch the child’s name on your square. Please, NO LONG STITCHES on your square anywhere (including your signature). These tend to get caught when the quilt is being put together. I am sure that the child who is snuggling with the quilt finds the same thing. Please use all the holes available even when making things such as cat’s whiskers for example. Do not use charms or beads or other sewn-on embellishments. 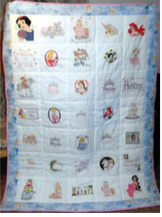 Besides being a choking hazard for young children, they can catch on other parts of the quilt during washing and cause damage. Signing Work: Please sign your work when you are finished. The children and their families just love to see where the squares have come from. Please do not stitch a date into the square. 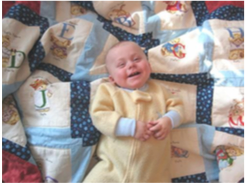 This helps when the squares are used at a later date for a child who receives a quilt urgently because of health reasons. Please sign your name (first name is fine) and location (city, state and country is fine or just the state and country if you are more comfortable with that) stitching it on the bottom close to the finished pattern. Please make the thread color dark enough so it can be seen. Try to match a color in the pattern if possible, otherwise use black. Care: If you feel comfortable washing and drying your square, please feel free to do so. The squares need to be forced dried by an iron. Just after washing, while the square is still wet, slowly iron with a moderately hot iron until dry. Iron the back side of the square, not the front. Put WASHED on the insert you place with your square with your name and email address. If you are not comfortable washing your square Love Quilts USA will wash it for you. Please put NOT WASHED on your insert. Please bring your finished squares to any SANG meeting, class, or stitch-in throughout the year. I’ll be gathering them and will take care of mailing them on to Love Quilts USA after our November program. If you prefer, you could mail the squares to me, or mail them to Love Quilts USA directly – if you chose to send the squares yourself, please drop me an email to let me know that you donated a square — I’d love to keep a running total of all we do. The program will feature a talk by Helen Schneizer of Threads of Blessing (previously known as Hands of Hope)-an international ministry of the Episcopal Diocese of West Texas. They are an inter-generational group of ecumenical women who support and nurture the creative process. By using each member’s unique talents, Threads of Blessing creates original pieces of textile art. Using appliquéd fabrics and hand embroidery, Threads of Blessing produces fine art banners, wall hangings and clerical stoles designed by group members. Members work together to create and sell the ministry’s own embellished works of art. The proceeds are then used to support the mission aspects of Threads of Blessing in emerging countries. Helen will bring some of the wonderful clothing, jewelry, hand bags and hand embroidery created by the ministry to share with us and for sale. All entrees include Fresh Green Salad, Yellow Squash, Oven Roasted Potatoes, Rolls, Butter and Peach Cobbler with Iced Tea to drink. Cost of the luncheon is $16.00 per person. Boots & Bluebonnets is the Region Seminar June 15-19, 2016 in Dallas, TX. The classes and registration form are on the Region Website egascr.org. Check out the classes. If you are not getting Emails from National including the January edition of E-News and the Region newsletter STITCHES contact egahg@egausa.org. You don’t want to miss anything. National is doing a new online course: Patriotic Sparkers II taught by Margaret Bendig. They are really cute. Leslie Gagliardi, EGA President, chose a collection of projects for her National Outreach Project. The cost of instructions for all four of the projects is $30.00 all proceeds to Alzheimer’s disease research. The pictures are in the January E-News from National. Can you believe it is February? So how well did we do on our SAL pieces? I am struggling with trying to get the silk to lay flat on my piece and the metallic to show up with some sparkle and definition. It may be why I put the piece away. I am so close to getting to the part I love about the design. I am trying to persevere. Wish me luck. For me this month is a little bitter sweet. Some of you know that one of my cousins passed away in May of 2015 of heart disease. What you may not know is that she is the one who taught me to cross stitch. Her birthday would have been this month and it is hard to pick up my stitching and not think about her. I miss her dearly. February has been designated “Stitch In Public Month” with the official day being February 6. I would like to encourage those of you who may not attend the Stitch-Ins on a regular basis that we hold at the local libraries to make an effort to attend one of these events. Remember our primary goal is to foster an awareness and appreciation for the art of needlework and embroidery. We will be teaching a children’s class in February at Forrest Hill Library on February 27, 2016. If you would like to help the Guild teach, please contact Joan Vanderbrink. All I can say is WOW! We have some extremely talented people whose talents extend beyond the world of embroidery. I enjoyed getting to see everyone’s other interest at our January meeting. Are there other aspects of your other interest that you can carry over into your stitching? Would you like to give a program on it? What other techniques would you like to see the guild do a program on? Final in a three part series. I started by listing some of the sources on the web that I used to gather material for our class. Part 2 was a list of steps for the fabric dyeing process. Part 3 covers the steps you’ll follow for dyeing floss. Use the plastic table cloth to cover your work area. Tape down with masking tape to keep it from shifting. Wear clothes that you will not mind if you get dye on them. Use gloves to prevent staining to your hands. Use an apron to keep your clothes from getting dirty. Prepare the dyes that you will be using to dye your floss. Be sure to shake up the liquid RIT dye before using. I used equal parts hot water to liquid RIT dye. For example: I used 3 tablespoons of dye, and 3 tablespoons of hot water. You do not need to mix a lot of each color dye if you are using multiple colors.I mixed the dyes in plastic cups for ease of clean up.Measuring spoons are helpful; however, plastic spoons can be used if you do not want to dedicate a set of measuring spoons. Do not use any utensil that you will use for cooking afterwards. Use a permanent marker to indicate the color in the cup. Place a dedicated foam brush in each cup and stir. You will be using Vinegar to set your dyes, so fill a small spray bottle with vinegar. Prepare your floss for dyeing. For Pre-cut Floss: Remove the paper bands from the floss. For Floss in Cones or Balls: Cut the desired amount that you want to dye. Use sturdy cardboard at least 5” long to wrap your cut length around. Remove the wrapped floss from the cardboard. Wet the floss prior to dyeing. Using a small disposable plastic container, place a squeeze of dishwashing liquid and fill with warm water. Wet your floss thoroughly in the soapy warm water. Let it soak for a few minutes. Try to maintain the shape of the floss without tangling it. Rinse in warm water to remove the soap. Place the wet floss on a pre-cut piece of plastic wrap. Use the foam brushes in your prepared dyes to add color to your floss.Apply in sections for a variegated look. Once you have added color to one side, carefully flip over the floss and coat the other side with color. Make sure to use the same colors of dye in the same sections of thread or you will get a muddy mottled affect. That’s fine if that is what you are trying to achieve. Once you have finished applying color to your floss, spray with vinegar and wrap in the plastic wrap. Place your wrapped floss packet in the microwave and heat in 10 second increments to heat your floss and create a little steam. Watch carefully. This should not take more than 30 seconds. How long it actually takes will depend on the wattage of your microwave. Make sure you do not heat it too long or you will melt the plastic wrap and/or burn your floss. Be careful when you remove your floss from the microwave. It will be hot. You may want to let it cool down a little before you remove the plastic wrap from your floss to rinse it. Rinse your floss in warm water till it stops releasing dye. Set on paper towel to dry completely before using.